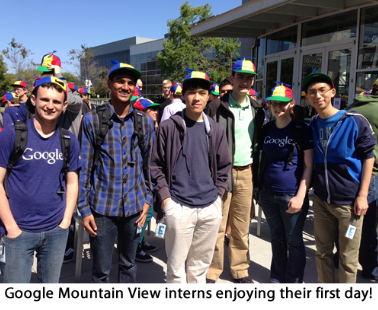 Our team works on all things related to interns in Google’s tech world. We are responsible for developing and maintaining Google’s internship programs which consist of everything from leadership speaker series, special learning and development sessions to a multitude of inclusive social activities. Overall, the team ensures every intern has a challenging, rewarding, and Googley internship. But, what exactly defines Googley? Company co-founders Sergey Brin and Larry Page once said: “Google is not a conventional company” and this also applies to our internships. 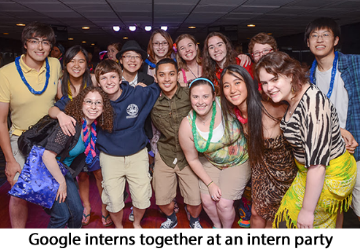 Google interns make an impact, are tasked with solving technical challenges that reach a global audience, and participate in an array of fun team activities ranging from Google cake wars to sushi-making and laser tag. So what do we look for in potential interns? We look for students with a broad set of technical skills who are ready to tackle some of technology's greatest challenges, and make an impact on millions - if not billions - of users. At Google, engineering interns not only help revolutionize Google’s massive product suite, but they also have the opportunity to work directly with full-time Googlers on massive scalability and storage solutions, large-scale applications and entirely new platforms for developers around the world. From AdWords to Chrome, Android to YouTube, Social to Local, Google interns are able to develop creative solutions to a wide variety of problems, affecting users across the globe. And where do we look for potential interns? Everywhere! Google is actively pursuing top intern candidates from universities around the world! We encourage anyone to apply that is interested in solving complex technical problems, collaborating on Google product initiatives and has a passion for developing their existing technical abilities. If this sounds like you, then perhaps one our technical internships is the perfect opportunity. If a lightbulb just went off and you’re thinking “I can totally envision myself as a Google intern”, then look no further! The team has been working hard year-round with interns and hosts, and we’re very excited for the upcoming summer 2014 class. We are currently accepting Summer 2014 applications for all of our internship programs! This includes the Software Engineering internship and Engineering Practicum internship. 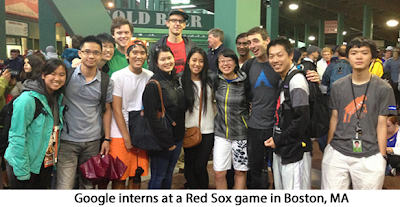 Our flagship tech internship is the Google Software Engineering Internship program. Open to students currently pursuing a Bachelors or Masters degree in Computer Science or related technical fields, this program provides an in-depth look at software development at Google. By having interns within all Google product areas, we allow interns to work within an area that suits their particular skill set and is deemed interesting to them. Within the Software Engineering internship, Google also has roles in Site Reliability Engineering (SRE) and Software Engineering in Test (SET). SREs are involved with keeping Google running from code-level troubleshooting of traffic anomalies to maintenance of our most cutting edge services. SETs work in multifaceted areas such as developing APIs for upstream product testing, developing productivity/build tools for engineering efficiency, developing best testing practices, and more. All of our software engineering interns are able to refine their technical skills through access to Google’s resources while experiencing the life of a full-time Googler. Our software engineering interns are heavily supported by Google leaders and also have access to passionate mentors seeking to elevate our interns to the next level while providing constructive career guidance. Google’s Software Engineering Internship program aims to provide each intern a unique and positive professional experience and deepen each intern’s passion for the power of technology and innovation. Google aspires to be an organization that reflects the globally diverse audience that our search engine and tools serve, and the Engineering Practicum program is designed to reflect the diversity of people and ideas that our company values. The Engineering Practicum program is open to undergraduate university students currently in their first or second year, majoring, or intending to major, in Computer Science or Electrical and Computer Engineering. The program is unique in that it gives first and second year undergraduate students the opportunity to collaborate with one another in fun and supportive settings, develop technical abilities to create production-level code, and experience professional life as a Googler. The deadline for applying for Google’s Engineering Practicum Internship is January 31, 2014. To apply for either of these programs (or others), simply visit the Google Student Jobs page and apply today. The team looks forward to reviewing your application! You’ve heard about Google internships, so now allow us to introduce one of the groups behind the scenes: meet the Tech Intern Team! If you were to meet us, you’d agree that we’re a passionate and busy team motivated by a mantra of helping develop the best and brightest students in tech. Additionally, the Tech Intern Team wants to go above and beyond in creating positive internship experiences for each technical Google intern.